Replacement lower suction duct hose for Dyson DC25 vacuum cleaners. This flexible lower duct hose.. This is a genuine Dyson washable HEPA post motor filter for your DC25 vacuum cleaner. Captures pa..
Genuine Dyson DC25 Vacuum cleaner brushroll assembly. 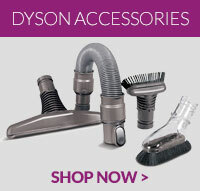 ..
Main duct assembly for Dyson DC25 vacuum cleaner models. This replacement spare part is the back ..